« Why would government ministers be allowed to claim higher rate of mileage twice in a single year? TWO TDs opposed the development of housing in their constituencies on the basis that it would have an adverse effect on the property values of neighbours. It probably would not be that surprising to hear one was made by Leo Varadkar … much more surprising the fact that the other was Clare Daly. The story in full is down below with each of the objection letters. There’s an interesting point to be made about FOI on how this story was researched where I submitted the exact same request to each of the four Dublin local authorities for all objections to housing received from Oireachtas members. Fingal County Council did a search of their planning database using “oireachtas.ie” email addresses as a starting point and were happy to release the letters. The other three – Dublin City, Dun Laoghaire/Rathdown, South Dublin – all refused on the basis that the documents are already in the public domain. And technically they are, buried as they are among thousands of planning documents, objections, drawings etc in public files. The new FOI Act does ask public bodies to do their best to assist requesters and while Fingal have certainly met that standard, the others did not even try to help or offer guidance. I asked two of them (Dublin City/DLR) to reconsider their decisions and passed on the methodology Fingal had used for pulling the letters together in a simple way, but they would not. I will revisit this myself at a later date and try to run the searches. 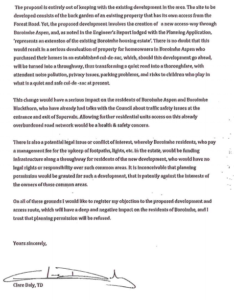 Six TDs opposed the development of hundreds of new houses and apartments in letters to a local authority. The letters, seventeen in total, looked for developments across North Dublin – including housing estates and apartment complexes – to be blocked in the midst of a deep housing crisis. Nine of the letters were submitted to Fingal County Council by the TD Clare Daly, who opposed plans for more than 300 homes at a variety of sites across the county. Among the developments she objected to were 173 new homes for Swords in North Dublin, 47 houses in Malahide, and 41 homes in Lusk. In at least one of the plans, the developers had promised the development of affordable homes saying they had already delivered 97 units in the area in previous phases. Social Protection Minister Leo Varadkar also opposed a housing development in Castleknock, which is in the heart of his Dublin West constituency. In a letter, he said the apartment block would impact on the “residential amenity” and “property values” of neighbouring homes. The records, which were released following an FOI request, show that Clare Daly was by far the most frequent objector. In four of the nine cases, Ms Daly opposed the plans because the developer involved had previously been involved in estates that were left unfinished or where pyrite had been used. She opposed five other developments on a variety of other grounds including traffic congestion, their effect on property values, and right of way issues. Ms Daly objected to fourteen new houses on a site in Malahide on four separate grounds in April 2014. She said the site was elevated and the new houses would overlook neighbouring properties, also saying there were unresolved boundary issues, congestion on the access road, and low water pressure in the area. Forty-seven new homes on the same road in Malahide were also opposed by Clare Daly. She said the provision of a new walkway would be unfair on residents of a neighbouring cul-de-sac, that a right of way would be extinguished, and mature trees would be chopped down. And she again cited heavy traffic in the area and problems with the water pressure. Ms Daly also asked for permission to be refused for the development of 173 dwellings at Ridgewood in Swords, the Dublin suburb in which she lives. In October 2014, she said she had raised concerns about the development with the Minister of the Environment and that the objection was mainly based on the traffic impact in an area already suffering regular rush hour gridlock. The TD said there were serious safety issues at the roundabout at the entrance in the site, which would be made “worse by the addition of almost 200 more homes”. A development in Malahide was also opposed by her in March 2015 where planning permission was being sought to change from building houses to an apartment block. In another letter opposing development of new houses – Ms Daly said the estate involved was unfinished and remediation work for pyrite had not taken place. She also objected to the developer building on three other sites around North Dublin on the same basis. Six more houses in Swords were also opposed by the Dublin North TD in March 2015 when she said the development was “entirely out of keeping” with existing homes and would require a new access road. “There is no doubt that this would result in a serious devaluation of property for homeowners in Boroimhe Aspen [adjoining road] who purchased their homes in an established cul-de-sac,” she said. Two developments were also opposed by Independent TD Tommy Broughan, who has also been a vocal critic of the government on housing. In December 2014, he opposed four detached houses in Howth, and in July 2015 the development of 71 apartments and 10 semi-detached houses in Sutton. Mr Broughan said there was already permission for thousands of homes and apartments in Dublin “that could be built tomorrow”. He said he opposed developments where he felt they were “unsustainable or an inappropriate density for the area”. Former Labour minister of state Aodhan O’Riordain opposed the development of 200 houses at a site in Howth, which he said this week was on the basis that the site was being over-developed. Fianna Fáil’s Darragh O’Brien objected to three schemes. Two of the cases were because the developer involved had left unfinished elements at a previous estate and the houses there had problems with pyrite. He opposed a third scheme for 54 houses at Balrothery in North County Dublin because there was no open space available for the residents who would live there. 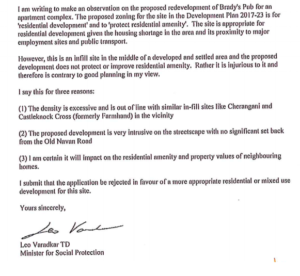 Leo Varadkar’s objection – sent in June of this year – was to the development of a former pub in Dublin 15, where plans were submitted for 41 apartments. In a statement issued through his Department, he said: “The site is currently a pub and car park. I think it is an appropriate site for much-needed housing that’s similar in height and scale to the neighbouring houses, not a big apartment block. That development was also opposed by Labour’s Joan Burton in June who said that while there was demand for houses in Dublin, these needed to be “good developments”.